Authors should read carefully the instructions before submitting their manuscripts. Manuscripts are invited from academicians, researchers and practitioners for publication consideration in all areas related to computer science and telecommunications. All manuscripts must be the authors' original, un-published work and must not be under-consideration for publication elsewhere. Commonly papers consist of the following sections: an abstract or summary, an introduction, a background or literature-review, presentation of the main contribution of this paper, methodology, findings, discussion, limitations, and conclusions. Each manuscript must include a 100 to 200 word abstract and a list of 4-to-6 keywords. Submitted article length must be less than or equal to 10 pages. Manuscripts must be submitted in English and accepted in MS-Word (.doc, .docx) formats only. IJCST does not charge for submitting papers to the journal. 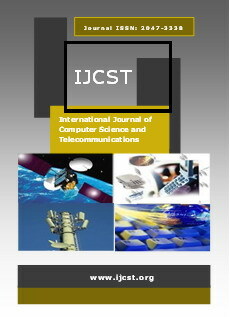 IJCST is an open access journal, but to cover cost of online-hosting, Internet-servicing, editing, handling, etc, it currently charges the publication fee for US$ 70 (per accepted article). All articles are subjected to a double blind peer-review process. The review process may take approximately 2-to-3 weeks. In initial review, it is ensured that the similarity-index of submitted article is below 12% as per IJCST policy. Upon preliminary evaluation by the Editorial Board, the papers are sent to two referees (experts in respective fields) for evaluation. After the reviewers have submitted their comments you will be contacted by an editor or AE regarding acceptance, provisional acceptance, or rejection of a manuscript. The decision of the Editor-in-Chief to publish a paper in concurrence with referee(s) opinion is considered final. After acceptance, the copy right form will be mailed to the corresponding author. One of the authors must complete the copyright release form. Please note: You are stating that the material in your paper is original and you have not previously released copyright for this paper to another party. We cannot publish your paper without this properly completed form.